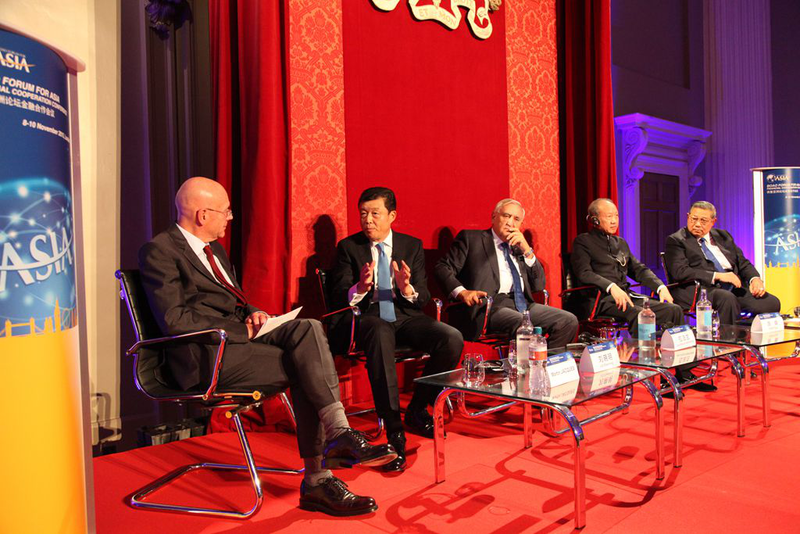 On 9 November, a panel discussion under the Boao Forum for Asia Financial Cooperation Conference was held at the Banqueting House in London. Martin Jacques, Senior Fellow of Department of Politics and International Studies of Cambridge University moderated the discussions on "Asia and Europe: A Dialogue of Civilizations". 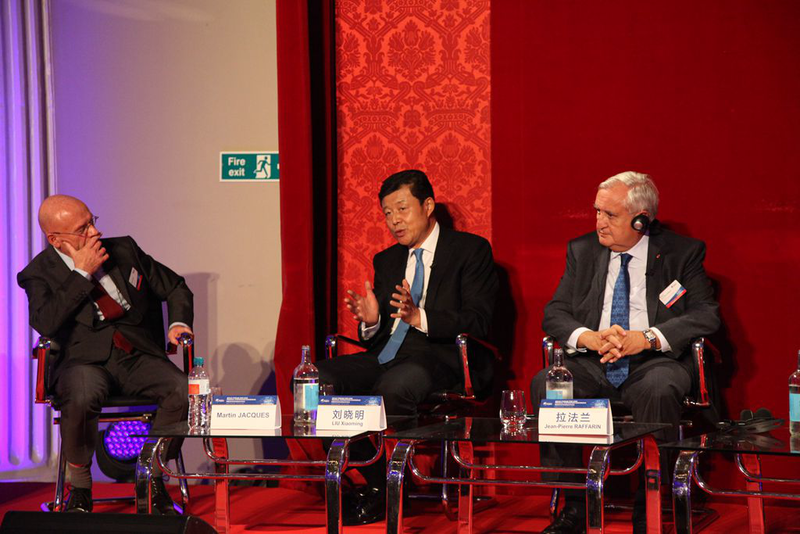 Ambassador Liu Xiaoming joined Mr. Susilo Bambang Yudhoyono, the former Indonesian President, Mr. Jean-Pierre Raffarin, the former French Prime Minister and Mr. Chen Feng, Chairman of HNA Group, in the panel discussion on this important subject. Following is an excerpt of the transcript of Ambassador Liu's comments. Martin Jacques: Da Jia Hao! Great pleasure to be able to moderate the panel of this evening. We've got a really big subject to discuss, which is "Asia and Europe: The Dialogue of Civilizations". This is a topic which I think will become more and more explored in the future with the rise of China. It's a difficult subject and we need a stellar panel to discuss it. Today we have such a stellar panel. I'd like to start with Chinese Ambassador Liu Xiaoming. Ambassador Liu, what do you think of the similarities and key differences between Asian civilization, in particular Chinese civilization, and European civilization? And how do you think working together they can promote mutual development? Amb. 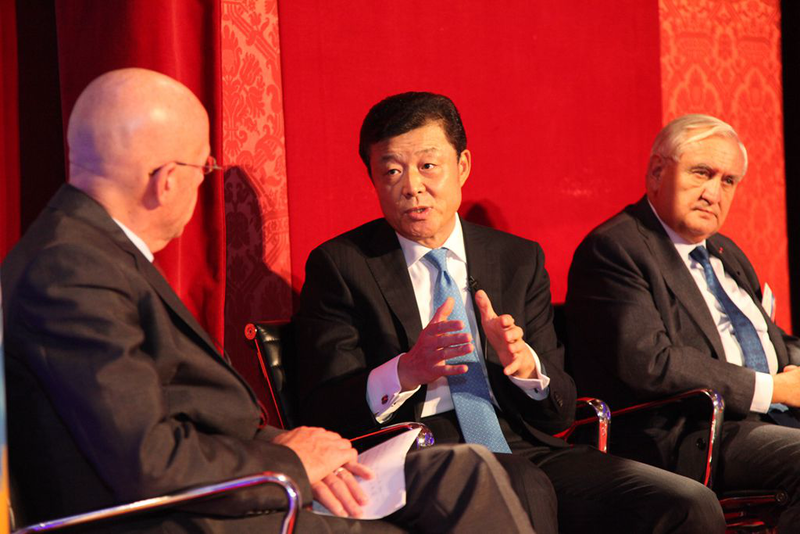 Liu Xiaoming: I think there are many common grounds between European civilization and Chinese civilization. Firstly, Both civilizations give priority to man. European civilization is based on John Locke's theory "man being by nature all free, equal and independent". Likewise, the Chinese culture also has a powerful tradition on putting people first. More than two thousand years ago, Confucius said, "The Way is never far from real people. Anything that appears out of reach and away from life itself is not the Way". In more recent times, Sun Yatsun, founder of modern China, came forward with the principles of "nationalism, democracy and people's livelihood". The Chinese Communist Party has advocated "serve the people, heart and soul". It shows that Chinese culture put people first. Secondly, both civilizations have similar ethical and moral emphasis. The Chinese have the tradition of valuing benevolence, righteousness, propriety, wisdom and trust. It is the same in the European culture. The third one is inclusiveness. European civilization has evolved from ancient Greek, Arabian, ancient Roman and Hebrew cultures. It has also benefited from Chinese civilization. For example, The Spirit of the Laws, written by Baron de Montesquieu, shows influence of Chinese Taoist ideas. The evolution of the Chinese culture has also been a process of exchanges and integration with different cultures of various ethnic groups. Take Buddhism for example, it was introduced to China from India, localized and integrated with the indigenous faith. It is now a part of Chinese civilization. When it comes to differences, I would not put it as "differences", but would rather say that the European and Asian civilizations have different emphasis. Take China for example. In Chinese civilization we emphasize peaceful temperament. Chinese history in the past thousands of years showed that China's development has always been inward. That is why despite its leading position for centuries, China does not have the tradition of invading other countries. The use of force overseas in certain dynasties was an exception, not the mainstream of Chinese history. No example is better than Zheng He, the Ming Dynasty navigator. He sailed down the Indian Ocean seven times. His fleet called at Indian and East African shores along the way. His mission was all about trade and friendship. Not an inch of land was taken. Middle-way and harmony is another emphasis in Chinese culture. We emphasize the balance between man and society, and between man nature. The third one is Holistic approach. The Chinese philosophy focuses on achieving holistic goals. When we set out to solve a problem, we Chinese tend to look at the big picture and define the general and principle framework. We believe that "When the outline is clear, the sub-categories will fall into place." That's why, in today's China, President Xi Jinping put forward the Two Centenary Goals, and Chinese government is making the five-year plan. We tend to think in the big picture, which is different from the Europeans who tend to focus more on details and individuals. Firstly, we should establish more platforms like Boao Forum, which plays a very active and important role in promoting understanding between different civilizations. Secondly, we should encourage more cultural exchanges and people-to-people dialogues, just like what we did in China-UK relations. This year, as was put by Prime Minister Cameron, is a golden year for China-UK relations. On top of the state visit, we also have cultural exchanges. 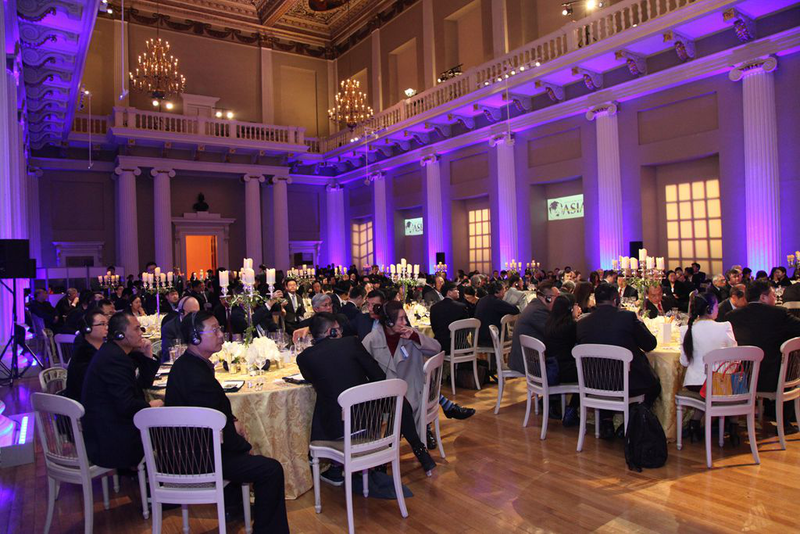 More than 100 cultural events have taken place in both countries, which improved and deepened understandings of the two cultures among the Chinese and British people. Thirdly, we should encourage more exchanges between young people, because young people represent both the future of their own countries and the future of the whole world. Fourthly, we should encourage more studies on each other's languages. During President Xi's state visit, he attended the Confucius Institute Annual Meeting and unveiled the 1,000th Confucius Classroom in the world. The UK now is a leader in Chinese language learning with the most Confucius Institutes in Europe. We should encourage more of these activities because you can only have better understandings on other cultures by better command of their languages. To summarize, I look forward to a greater role to be played by Boao Forum in promoting better understandings between different civilizations and in continuing its contribution to make our world a better place. 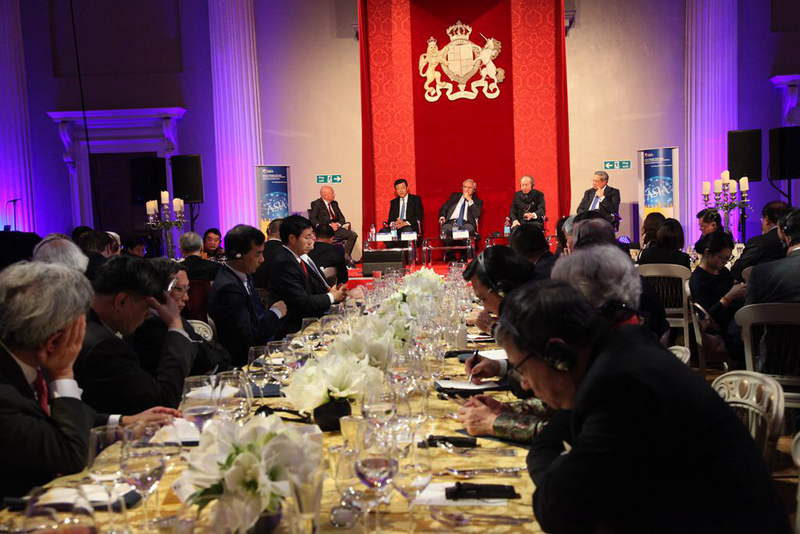 I wish to see more of Boao Forum in London.